Most of the laughs didn’t work for me and, it pains me to say this because he seems like such a nice guy, but Garcia is too green to co-star in a major motion picture like Puerto Ricans in Paris. Luis Guzman (Boogie Nights) and Edgar "Eddie" Garcia (How to Make It in America) sat down one day with Writer/Director Ian Edelman and brainstormed ideas. The Childhood friends wanted to make a feature film together and just needed the right vehicle. Hence, Puerto Ricans in Paris was born. Luis and Eddie are New York City cops busting criminals for selling fake designer handbags to unsuspecting tourists. After their latest bust, they attract the attention of the owners of a Parisian fashion house whose new handbag prototype has been stolen. They ask Luis and Eddie to fly to Paris and find the missing bags before fake versions can flood the market. While in Paris, Eddie discovers a love of culture and shows his sensitive side while Luis tries all his "playa" tricks on the beautiful French women to no avail. Ultimately, Luis learns the lesson that his game isn't cute on a thirty-something male and he returns home to beg his girlfriend's (Rosiario Dawson; Sin City) forgiveness. Meanwhile, the two cops solve the caper and save Collete's (Alice Taglioni; French Women) company. The opening sequence of the film shows great promise, but, sadly, the movie doesn't live up to the potential. Many of the jokes fall flat and aside from the aspect of a classic "who done it", there isn't much to entice the audience. The personal relationships are cliché and Luis' "epiphany" is trite. I suppose if one can personally identify with the characters, the movie is more interesting and entertaining, but since I don't fall into that category, I didn't enjoy it all that much. Guzman's acting experience helps him create and portray his character nicely, though I'm not sure how much of a stretch it was from his own personality. Garcia's lack of Hollywood roles is apparent, almost from the beginning, and his acting is less polished. The real gems of the film are the women, though. Dawson and Rosie Perez (Pineapple Express) lend their significant acting chops and star power to every scene they are in and Taglioni has a presence onscreen that is undeniable. These ladies all emit an air of confidence and power that really radiates. The scenery is also magnificent at times, though Guzman admits they only shot in Paris for three days and much of the European city was actually filmed in Prague. Edelman does a decent enough job capturing the essence of Paris without having spent much time there, but some of his edits seem choppy, which interrupts the flow. Puerto Ricans in Paris had a solid concept, but the execution was lacking, which made the movie less entertaining than it could have been. Most of the laughs didn't work for me and, it pains me to say this because he seems like such a nice guy, but Garcia is too green to co-star in a major motion picture. As buddy cop movies go, there are so many others that are simply better done. This one will appeal to a certain demographic, but for anyone outside that ethnic group, the film really doesn't resonate. 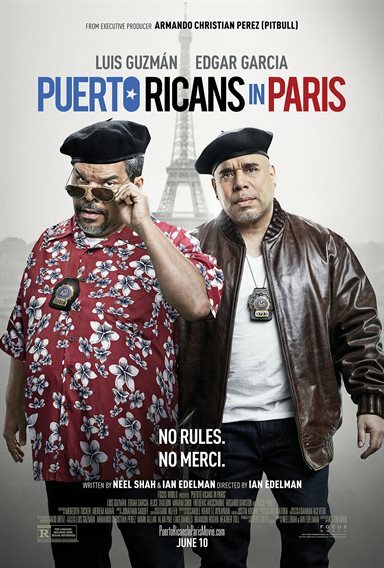 Download Puerto Ricans In Paris from the iTunes Store in Digial HD. For more information about Puerto Ricans In Paris visit the FlickDirect Movie Database.